You probably have heard the grumbling from some people, saying how could gluten intolerance be real, we've eaten wheat since biblical times and that this is all in people's heads. You see whole sections of supermarkets devoted to eating gluten-free, and restaurants trying to keep up with separate menus and options. So what's the real story on this? Let's straighten out a few things first, just so we're all clear. A gluten allergy is different from an intolerance, even though people will use the terms interchangeably. They're not the same thing. An allergy is an IgE immune response of the body, and you've seen IgE responses before, ranging from hives, asthma, itchiness, to tightening of the throat and anaphylactic reactions. The word "intolerance" refers to a different part of the immune reaction, and it can often be hours or days before the reaction occurs. And when it occurs, it can be so unrecognizable that associating it with a food might never happen. And this is the challenge of gluten intolerance. Despite the thought that gluten intolerance is a "new" problem, it was actually recognized back in the ancient Greek days, where Areatus of Cappadocia in 100 A.D. spoke of a condition called "Coeliac Affliction" with many of the symptoms we see today (and it's from where we get the name). Dr. Willem Dicke noticed during WWII that when rationing removed wheat, barley and rye from people's diets, the incidence of childhood diarrhea he was treating diminished dramatically, and when rationing was lifted, it returned. So what's gluten? It's the "glue" that makes dough easy to work with — corn bread, which doesn't have gluten, tends to crumble, but dough that has gluten is stretchy and rises well. 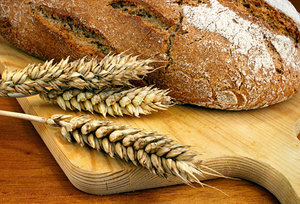 Wheat (and rye, barley, spelt and kamut) contains gluten, which is made up of two proteins that have been shown to cause reactions in people: gliadin and glutinen. One of the reasons we now have this modern problem of gluten intolerance is because the wheat we eat now is wildly different that the wheat from biblical times. That was Einkorn wheat and if you ever see pictures of it, it's barely recognizable as the wheat we know. The wheat that we have (the third largest crop behind corn and soy) is called Dwarf wheat, and it has been genetically bred to contain four times more gluten than it had 50 years ago. It actually has twice as many chromosomes as the traditional Einkorn wheat and those new chromosomes are coded for different gluten (and more irritating gluten) than that Einkorn wheat — hello, GMO! So between the huge concentration of gluten in wheat, the new-to-us gluten proteins and the huge carbohydrate overload of the typical diet, we've introduced this irritating protein in such overwhelming amounts our body almost cannot NOT react. One of the biggest misunderstandings around gluten intolerance is thinking that Celiac disease is it's only form. Actually, they've identified the genes for Celiac disease AND the genes for gluten intolerance and in total, it is estimated that 81 percent of the population has these genes. It doesn't mean that the genes are turned on, per se, but it certainly shows why there is a rise in the number of cases. In fact, in a study that compared blood samples from 10,000 Air Force recruits in the 1950s to 10,000 people today, there has been a 400 percent increase in Celiac disease over the last 50 years. And that's just Celiac disease, which is described specifically as intestinal damage that flattens the villi. Gluten intolerance can cause much of the same damage physiologically, just without affecting the villi. So what is that damage? Damage from gluten falls into three general categories (and can certainly spill beyond them): digestive problems, mental/emotional/neurological problems, and autoimmune problems. Mistakenly, many people have thought that you have to have digestive problems to be reacting to gluten but that's not true — gluten can "leak" through the damaged intestines and cause a low-grade autoimmune reaction and damaging any susceptible tissue. The inflammation caused by the damage can be the trigger for everything from obesity, insulin resistance/diabetes and heart disease, just like inflammation from anything else can cause those problems. In our practice, we start to suspect gluten intolerance if a patient has two out of three: digestive problems, mental/neurological, and/or autoimmune disorders. And what are the diseases associated with gluten intolerance? Autoimmune disorders like Hashimoto's disease (98% association), Grave's disease, Type 1 diabetes, rheumatoid arthritis. Digestive problems like reflux, inflammatory bowel disease, irritable bowel syndrome, and pancreatitis. Blood problems like inducing Factor V Leiden, and thromboembolism, as well as pernicious anemia, iron anemia and megaloblastic anemia. Skin disorders like eczema, psoriasis (which is also autoimmune), hives, dermatitis herpetiformis, and patch balding (alopecia areata). And then neurological conditions like multiple sclerosis, cerebellar ataxia, migraines, depression, phobias, dementia, Parkinson's, Attention Deficit Disorder, neuropathy… the list goes on and on. It was thought that you didn't have Celiac disease if the "gold standard" (which isn't anymore) of an intestinal biopsy showed flattening of the villi, but it's now known that by the time you see that, the damage has been happening for years. In fact, new pediatric research is recommending that if a child is genetically tested and has the genes, and then also shows evidence of gluten antibodies in the blood, that they don't wait for more damage and simply take the child off gluten. The same could and probably should be instituted with adults. Which is the next problem — there's tons of inaccurate testing and "old" testing still being used that is not accurately catching gluten intolerance or Celiac disease. When a patient comes into my office and says his or her doctor said they didn't have Celiac disease, I never believe it unless I see the test myself and unfortunately, many of the tests that are used in standard medical offices are not sensitive enough or, like the biopsy, wait too long. Currently, the only really accurate testing is a stool biopsy looking for immune antibodies. A lab that can order an accurate gluten intolerance panel (as well as the genetic testing if they so wish) is Entero Labs (www.enterolab.com). Another thing to be aware of is that once off wheat and gluten, many people leap directly for the gluten-free products and indulge in gluten-free brownies, gluten-free pasta, gluten-free pancakes and the like. OK, so you're not causing a gluten reaction, but that doesn't mean that carbohydrate overload is good for you. Remember that those grains haven't been properly prepared as well, which explains why sometimes people end up with additional reactions to them, since NO ONE is meant to tolerate large amounts of teff, millet and quinoa. It would be better to avoid most grains and stick to protein, vegetables and fats, rather than annoy your system with more indigestible grains. If you can begin to recognize the trifecta of neurological conditions, autoimmune conditions, and digestive conditions and begin to realize that modern wheat is causing a huge amount of problems, you can help an enormous number of your patients. We've had patients reverse multiple sclerosis (completely eradicating the lesions in their brains, much to the surprise of their neurologists), handle their Hashimoto's without medication, reverse "undiagnosable" and "permanent" digestive problems, permanently alter their depression, and much more. It may be the missing link for some of your patients.